CEF Type 42 Peregrine Gunship Preview! Our modeler, Tony, has been busy on another 3D Model for the Heavy Gear Blitz line. This time he's showing a bit of loving for the Colonial Expeditionary Force players out there with a new VTOL aircraft for the faction. Read more about CEF Type 42 Peregrine Gunship Preview! Scorpion Attack Helicopter Available Now! The new Scorpion Attack Helicopter (VTOL Aircraft) for the Northern faction of Heavy Gear Blitz is now available to order on the Dream Pod 9 Online Store. Alain over at Fusion Models finished up the production molds last week and ran the first 2 copies for the Capital Games Expo, which we attended over the weekend. Attached is a photo of the assembled Scorpion unpainted resin, with a photo of all the parts included in the kit below it. Read more about Scorpion Attack Helicopter Available Now! Updated Heavy Gear Blitz Living Rulebook ebook Available Now! We have updated the Heavy Gear Blitz Tabletop Wargaming Living Rulebook Beta ebook, and it is now available for free download via DriveThruRPG. The updated ebook has September 30th 2015 Update at the end of its file name, along with an Update Changes Log of the same date and updated Game Tokens and Force Record Sheets as well. Plus we added new Badlands Buildings and Stoneheads paper terrain sheets to the downloads for everyone to use. Read more about Updated Heavy Gear Blitz Living Rulebook ebook Available Now! Our new 3D modeler, Tony, finished up the Titan Attack Helicopter project last week. The Titan is used by Terra Nova's Southern Factions and besides being an attack helicopter it also serves as a transport and can carry a full squad of infantry. The preview image included shows two views of the 3D model from front left and rear left. We'll get an exploded parts view image up in our next post on Tuesday. Read more about Titan Attack Helicopter Preview! Jovian Chronicles Miniatures Available Again! 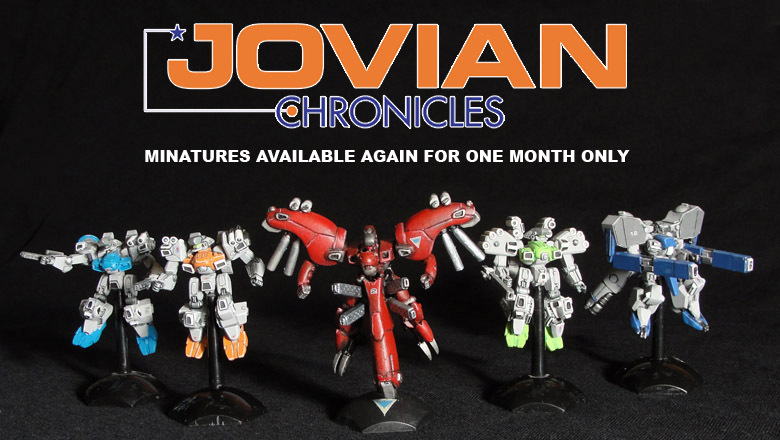 Read more about Jovian Chronicles Miniatures Available Again!